Meet the people behind Pamomile Fine Handmade Soaps and Accessories. For Pam, a move to a small village in southern New Hampshire in the seventies, brought her closer to the realization of just such a simpler way of life in the country. The circa 1790’s cape with every door and window at just a bit of a slant, is the cozy place of home. Flowers from the garden and ephemera of the past fill the nooks and remind us of our roots. Natural rhythms of the country mean that there is always something to do and...something beautiful to see, be it in the garden, at the bird feeders or in the field out back. 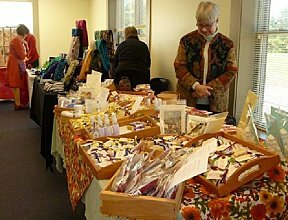 Attracted by the appeal of making handcrafted soaps as her “granny” once did, Pam began soap-making in 2000. Both the process and the product, each so satisfying to the senses, soon became a passion. To Pam, soap-making seemed a natural extension to country living, and fulfilled the creative desire as well. Wendy’s international travels and experiences as quilter, caterer, and amateur herbalist have all helped to refine her attention to detail. Such thoughtful and careful consideration is evident in the accessory products she hand-crafts for Pamomile. Her vintage-looking saltbox sits adjacent to the picket defined herb garden. Wendy spends many hours on her sun-dappled porch, hand finishing her Pamomile accessories. The rosa rugosa, rocky shores, and sandy beaches of southern Maine are minutes away by auto. A carton of just-fried clams or a specially packed box lunch by Wendy turn any day into the quintessential outing. Throughout the year, Pamomile was grateful for the opportunity to deliver soap on a seasonal basis to the Hillsborough District Food Pantry of southern New Hampshire. This past year, PAMOMILE had the opportunity to meet even more of you, to participate in additional events, to have its story told in the regional periodical, Monadnock Table and to have a presence at two prestigious historical sites (The Fells and the Brick Store Museum). Your stories pertaining to PAMOMILE products are wonderful!